Past guests of Uniworld, Trafalgar, CostSaver, Insight, Luxury Gold, African Travel, Brendan and Contiki save an additional $150 per person off this trip. Click here for eligible departures. Arrive at Bordeaux-Mérignac International Airport. If your cruise package includes a group arrival transfer or if you have purchased a private arrival transfer, you will be greeted by a Uniworld representative and transferred to the ship. 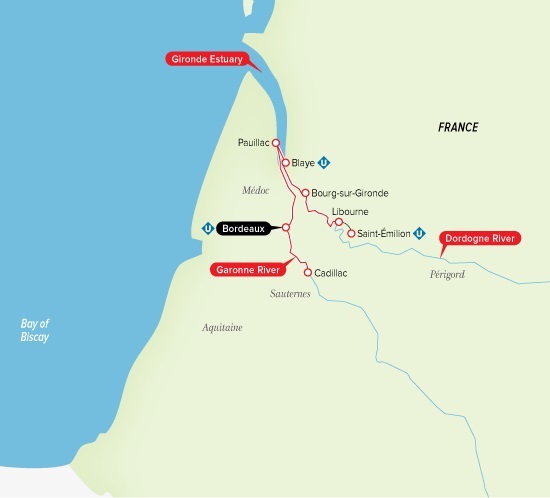 Embark on a scenic drive from Blaye to Bourg along the Route de la Corniche Fleurie and marvel at the sights of Blaye Fortress and Lansac Windmill along the way. Slow things down in Libourne and on your return to Bordeaux with multiple wine tastings, village tours, a farmers’ market visit and Bordeaux heritage walking tour. Join us on a showcase of the best Southwest France has to offer. Prices exclude additional port charges of $190 per person.